Far Fetched aspires to create heartfelt, inspiring Jewelry, which is rich with culture and craft and using conscientious business practices and fair trade principals. 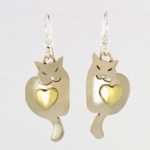 All of their creations are designed in Sebastopol, California and are handmade by artisans in sterling silver, copper and brass. Most of their designs are produced from sheet metal, which is cut and formed using traditional jewelry making techniques passed down from family members and neighbors, as well as more recent innovations that Far Fetched has introduced. 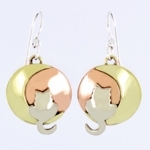 Earring Girl loves their use of mixed metals and their whimsical designs!